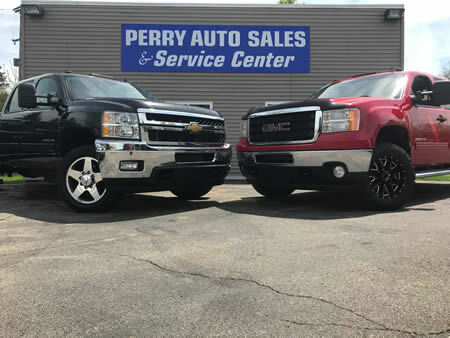 Perry Auto Sales - The largest independent used truck dealer in Michigan. We are Michigan's only truck dealership with a full performance center right on sight! We have a brand new 3000 sq foot service center to fit all of your Duramax, Cummins, and LS performance needs. Your one stop shop for truck sales and the ability to customize your truck at the time of purchase in many different ways! Serving areas in Perry, Morrice, Shaftsburg, Bancroft, Laingsburg, Owosso, Durand, Vernon, Corunna, Williamston, Gaines, Byron, Argentine, Webberville, Fowlerville, as well as all of Michigan and the Midwest. Our knowledgeable sales representatives are committed to providing you with a "no-pressure" buying experience. We want to make sure you find the vehcile that meets your needs and fits your budget. Don't see the truck vehicle your looking for? We can find it! Fill out our vehicle request form or give us a call! We pay more for your used trucks then any other dealer because we know what they are worth! When it comes to selling quality trucks... No one does it better than us!